Many of us already choose to communicate our reactions through the medium of GIFs, but now, thanks to the newly relaunched Giphy Cam app, it's possible to star in your own. Giphy, the vast repository of GIFs applicable to every conversational situation, has put out the reinvigorated 2.5 version of its Giphy Cam app. In a similar vein to Snapchat's filters, this version allows users to record a short video and embellish it with effects and stickers. 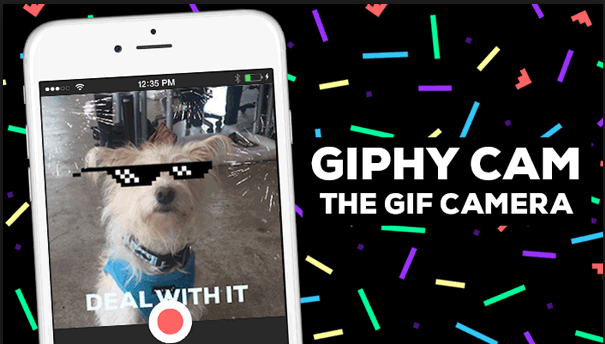 Giphy Cam takes it to the next level, however, turning your grin or grimace into a full, looping gif that can then be shared through text, Instagram, and pretty much any other channel. On top of this, you can smother yourself with up to 50 stickers at once, all of which will follow you around using the app's face tracking technology. Giphy also promises that users can add an "infinity" of effects, bringing joy to those with unprecedented levels of spare time. Other features include a burst mode that creates a stop-motion GIF, and the option to reverse, loop, or even "ping pong" the GIF. What really lets the app shine, though, is the potential to add custom stickers including any of the GIFs in the Giphy archives, recreating your favourites or even having them star alongside you. According to an article on Mashable, the Giphy stickers and gifs occupy a 3D space, allowing them to rotate and stick with your face as you live out your GIF dreams, and attesting to the burgeoning popularity of augmented reality. Speaking to Mashable, Giphy's Head of Design Ralph Bishop laid out their vision for the app, and threw down a respectful gauntlet to Snapchat, stating "I love what Snapchat's doing, but it's ephemeral. It's disposable. It's cool, but that's one use-case. With GIFs, we're building a language." Sitting at 4.5 stars on the App Store and Google Play at the time of writing, Giphy Cam has garnered strong reviews for the new version. So next time you want to express your love online, why not slap some stickers on your face and drive it home using modern symbolism such as pizza and Adventure Time, rather than worn-out old heart-eyes emoji!